These costumes were very tricky to make. I used the old McDonalds commercial from the 80’s for the idea. They did a take-off on "Mac The Knife", and called the moon head with the sunglasses "Mac Tonight". Having no idea how to make the moon head costumes, I first thought papier-mache would be the best way. I made the skeleton out of chicken wire in the shape of a crescent moon. Then I tried to papier-mache, very messy…too heavy. So I cleaned it up and decided to wrap masking tape around the chicken wire to make a bottom layer. Then I spread Elmer’s glue around all over it, and applied tufts of fiberfill to cover it evenly. Finally, I wrapped the whole thing in cheesecloth. I made the sunglasses out of construction paper and glued them on. I cut the mouth opening and the head opening to make sure that the kids could see out the mouth and that it sat on their shoulders comfortably. 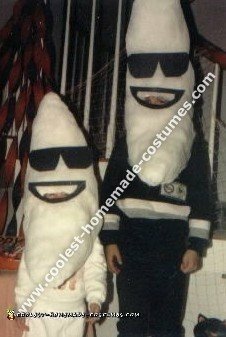 I had them wear white and black sweat suits for the rest of the child Halloween costumes. People stopped us on the street to see where we got these great child Halloween costumes!